The founding of the Presbyterian Church of Nigeria arose out of the enthusiasm of the young church in Jamaica. The first mission party arrived in Calabar in 1846 and settled into a routine of preaching, teaching, campaigning for social reform, ministerial training, and practising medicine. With the coming of the British Empire after 1890, a new generation of missionaries—armed with a kind of colonial mentality—appeared; thirty years later there was a network of churches and schools, and the missionaries who had begun as pastors of congregations had become administrators of districts. By the 1930s the church had developed a large corps of trained teachers and a smaller corps of trained ministers, men and women who were beginning to assert their independence. By 1950 the nationalist period had begun, a period marked by rapid growth of primary and secondary schools and teacher-training colleges and, most importantly, by a shift in power from the Mission Council to the Synod, which represented the church as a whole. By 1960 the church was back where it had started—with its affairs regulated by a court in which missionaries and natives sat and argued as equals. A former president of the American Historical Association observed more than fifteen years ago that "mission history is a great and underused research laboratory for the comparative observation of cultural stimulus and response in both directions." 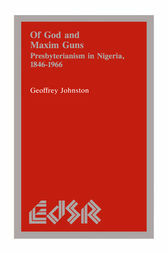 In God and Maxim Guns, Geoffrey Johnston makes a substantial contribution to the field of mission history.